So you decided to redesign the company website. After all, that design your nephew Jimmy did back in 2009 is starting to look a little dated. This time around you decided to upgrade the company image and work with a professional website design company. You haven’t done that before, but if your nephew could do it in four months, a professional should be able to do it in one month easy. In fact, you are going to synchronize some off-line marketing to coincide with the new website. You want to build in some padding, so you schedule the off-line marketing 2-months out. Telepathy is a rare talent and highly unreliable. Therefore your website design company may actually have to communicate with you periodically. And as inconvenient as it may be, you might actually have to communicate with them every now and again. Monday the 1st: The agreement has already been signed, and today is the kickoff meeting with your web development project manager. You figure you can get this website up and running in about 4 weeks tops. The project manager asks you for your design preferences and reminds you that the website should be designed around your target market, not necessarily you. However he also reminds you that you have to live with the site, so it’s important that it reflects your company’s image and values as well. You agree to send a few examples of websites that you like and what you like about them so that he can put together a creative brief for the design team to use as a guide and start the design process. Wednesday the 3rd: You get a quick reminder from the project manager that they have scheduled time to work on your project, but really need to get those examples you promised them. You know it’s in your own best interest to get this thing going, but you have a few important things to attend to and you can probably get to it before you leave today. Something else comes up but you know you can get to it tomorrow sometime. Thursday the 4th: You start thinking about some of the websites you like. You remember that some of your competitors have some pretty nice sites, and you like their various styles. You hastily copy a few URLs and send them off to your web developer before you leave for the day. The project manager glances at it before he leaves, and schedules himself to look over your examples and write up the creative brief first thing in the morning. Friday the 5th: The project manager checks out each of the examples and quickly discovers that the designs are all over the place…some colorful and elaborate with animation, some more clean with a lot of whitespace. All good designs, but so varied that the project manager has to call you up for clarification as to what your preferences really are. You tell him that you really like a particular one you’ve envied since you first saw it last month. The other ones were just competitors that you thought he might like to see. He thanks you for the clarification and figures he can finally write up the creative brief for the design team after he gets back from lunch. Now that he has what he needs for the design team, he can schedule his best designer to get started with the first round of comps on Wednesday (after the weekend). He would have had the web designer start on the project the previous Wednesday when he had an open slot, but waiting on your feedback allowed 2 other projects to sneak in ahead of you. Wednesday the 10th: The designer is ready to go on your project and diligently works on it the moment he gets in to the office. He has a couple of good ideas and wants to show you a few versions and get your feedback. These are essentially “sketches” not finished designs. Once he gets a sense of the direction you want to go after getting your feedback, he will fine-tune and really concentrate on the one you like the best. He’s real excited about the designs and wants to look them over in the morning before he sends them to the creative director for review. Thursday the 11th: The creative director loves the designs but has some feedback for the designer and wants a few revisions before showing them to you. Just before lunch the designer gets them back with the revisions and sends them over to you. You’re off site at a meeting but you got it on your smartphone. Obviously you can’t review it until you get back to the office tomorrow where you can properly review them on a desktop computer. Friday the 12th: You have a couple of commitments that you have to get to because you were off-site yesterday. You’ll get to the website review on Monday sometime. Monday the 15th: You looked over the designs when you first got in and you had some specific recommendations and feedback, but you need some “alone time” to put it into words. After wrestling with this for a while you decide to get your team together and review it as a committee. Easier said than done…. Can’t get everyone in one place at the same time until the Thursday meeting, but none of us are as good as all of us, so it should be worth the delay. Thursday the 18th: Well, you got everyone together, but rather than simply getting buy-in on the design changes and your ideas, everyone has an opinion. Well…at least they feel obligated to have an opinion. After all, you did ask, and just simply agreeing with you doesn’t do their career any good, so they feel obligated to add something of “value”. This naturally involves changing something. Otherwise what good are they? By the afternoon, the committee has put together a list of disjointed recommendations (each member making sure they contribute something, whether it’s necessary or not). Now you just have to sort through and organize it into cohesive feedback. Oh heck, “I can’t think right now and that design company keeps asking me for the feedback”. So you just send that blueprint for Frankenstein’s monster over to the web designers and let them figure it out. After all, they’re the professionals. Friday the 19th: The designer gets the “group” feedback, which now resembles nothing like the original creative brief. It’s his job to keep the client satisfied…and produce a quality design. He legitimately wants to do that, but now he really has to think about this. Maybe he’ll figure it out over the weekend and get back on it Monday the 22nd. He may need the project manager to get back with you for some clarification. This feedback cycle is normal, inevitable and to be expected. In this scenario we’ve already used 3 weeks and still don’t have the final design on the horizon. We still haven’t even addressed the content for the website, which should be developed in parallel with the web design so the site can immediately be populated once the design has been finalized. Tip #1: Batch all your changes and feedback. Professional Web designers don’t typically piecemeal their day together, they schedule projects in advance. Why? Because switching projects requires them to locate access information like passwords and files. In order to make changes to a website that is already online, they have to download the website, make the changes, upload the website and test it. They may also need to have it reviewed by a manager. The fact is, it often takes about the same amount of time to make one change as it does to make 5 changes. If the project manager asks you to weigh in on 4 things, and you only address 3 of them, that might be all it takes to put the project on hold until they can get clarification from you. An experienced project manager will often number the feedback points because it’s easier for the client (you) to make sure you address everything. Spend the extra few minutes it takes to be very concise with your feedback. Make sure you re-read it before you send it. If the designer misinterprets your direction, he may spend hours going down the wrong path. This is not only going to cause delays in order to re-do the work, it will often cause additional delays because they have to attend to other projects that were idle while working on the wrong thing for you. You might find yourself in the back of queue when you should be heading into the next phase of the project. As much as you might envision your design team being on call, a busy web design firm has a constant stream of projects they may be working on during any given time. What happens during that extra day while waiting for the client to get back with the missing info? Well another client (or two) may sneak in ahead of you. Keep in mind that designers like to design, and project managers like to manage. You may be special to the project manager, but then again….so is everyone else on his list. For example, perhaps you have decided to provide the content for your website…writing the text for each page yourself. Or assigning it to an overworked subordinate. If you’ve opted to take that portion of the website on yourself, remember as pretty as the design is, it still can’t go live without the content. For those of you who are bent on self-destruction, we’ve put together The Experts Guide to Flushing Your Web Design Budget down the Toilet. Quite frankly, we’re not above sarcasm to make our point. 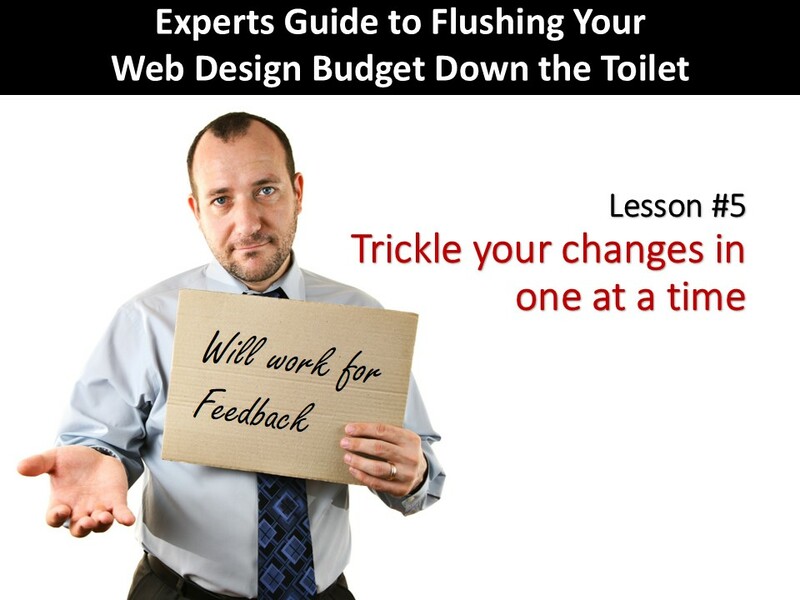 How to flush your website budget down the toilet from Kreative Webworks, Inc.
Kreative Webworks: Orange County Web Design since 1999!